I recently watched a documentary called The Magic Pill by director, Rob Tate. In it, he highlights several cases where a change of diet is used to overcome illnesses such as autism, cancer, diabetes, and heart disease. The movie has gotten its fair share of criticism for being part of the rash of trendy food documentaries that are scaring people into thinking that a particular diet is better than all the others. I don't condone these movies and see them for what they're worth: advertising for warring food companies. In my mind, the key is developing some critical thinking skills that allow us to parse the true from the false. The body uses food to fuel everything it does and the quality of the food is critical to the performance of the body. It's not unlike a car depending on high quality gasoline. The body is capable of adjusting to whatever the environment sends its way. If a sugar-laden soft drink enters the body, it does one thing; if a steak shows up, it does something different. If a virus makes its way into the body, it reacts one way; and if ragweed pollen shows up, it responds differently. This is all the result of the body's desire to achieve homeostasis. Life can only persist under the right conditions and all living organisms have mechanisms to regulate the conditions and keep them alive. So even though the environment is constantly changing, the body senses the changes and tries to adjust all of its processes to keep things the same. So any condition where the body changes, like weight gain or illness, is a sign that the body is trying to respond to some bad input. So why is it that people believe that fitness is the key to meaningful weight loss? If you feed a car bad gas and clog up the fuel injectors, do you fix it by running it harder? Of course not. But for the past 50 years or so, humans have been convinced that exercise is the key to losing weight. 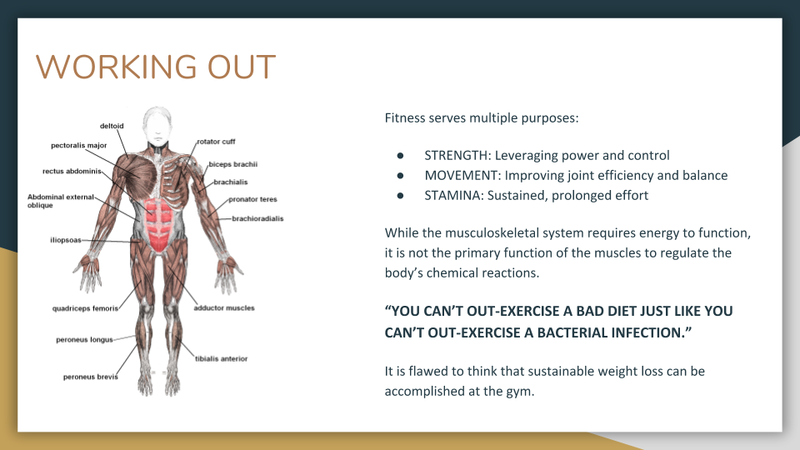 That somehow, muscle is the solution to the poor quality of our food supply. Because adding high-performance tires and taking a cross-country road trip will clean out those clogged fuel injectors, right?? There are a lot of great benefits to working out. You can get stronger to do all the things that you need to do in your daily life. By working with a movement expert, you can learn how to move properly to minimize damage to the joints. You can increase your stamina so that you can continue to do the things you love for longer periods of time. You can improve the aesthetics of your body by building up muscle in specific areas. There are even emotional benefits that come from pushing yourself physically. But the musculoskeletal system is not directly responsible for managing weight gain/loss, so using fitness as the primary means of losing weight is a waste of time. Any experienced, certified personal trainer will tell you: "Abs are made in the kitchen" or "You can't out-exercise a bad diet". We've known this for as long as human beings have walked the Earth. This is not to say that fitness plays zero part in weight loss. After all, the muscles use energy that comes from food. But the part that they play is so infinitesimally small compared to proper nutrition that the biggest sustainable gains are almost entirely from changing what & how you eat. I work out because I enjoy improving my strength, endurance, movement, and the emotional benefits; not because it's going to help me lose weight. So if food is the key to weight manipulation, is it so far-fetched to think that the body, in its search for homeostasis, could also change other aspects of itself in response to the things it ingests? Not at all. It's no surprise that the rise in obesity and incidences of diabetes, heart disease, etc. have all taken place in the last 50 years where our focus on fitness has caused us to take our eye off the ball that really matters: our food.